The year was 1760, a conspiracy was being hatched far far away in Kabul to loot Delhi. After the death of Emperor Aurangzeb in March 1707, the Mughal Empire never saw a formidable ruler at its helms. The empire was free for scavengers to take a bite at. Taking advantage of such pitiful situation of the Mughal Empire, the Shah of Afghanistan Ahmed Shah Abdali of the Durani Empire marched on to Delhi. This would be his fifth time to loot and plunder the capital of the Mughals. The saddest part was that his loot was sponsored and resourced by Najib-ud-Daula Rohila from Doab (present day Uttar Pradesh) and Nawab of Awadh Shuja-ud-Daula. In return of the sponsorship, Najib and Shuja wanted to be pronounced as prime minister and Minister for Treasury of the Mughals. Abdali brought with him an army of Afghans, Baloch, Pashto’s, Rohilla’s and other Afghan tribes. All together with Najib and Shuja at aid, Abdali’s camp stood a Hundred and Twenty Thousand men strong. Death of Aurangzeb saw the decline of the Mughal Empire and the rise of the Maratha Empire under the leadership of the Peshwas. Peshwa Balaji Vishwanath and his son Peshwa Balaji Bajirao had rapidly changed the politics of India and extended the territories of Maratha Empire in northern India. Irony is such that Marathas that brought down the Mughals were now with the signing of treaty between the two empires, had become the protectorates of the Mughals, in exchange of rights to collect taxes and govern the Mughal Empire. This rise in power of Marathas was thorn in the eyes of the Rajput’s and other princely states in northern India. But, each time that the pride of Delhi was challenged the Marathas obliged and stood as a bastion to defend Delhi. With Abdali once again on his march to Delhi, Marathas yet again showed that they had not forgotten their duty. Peshwa Nana-saheb declared war against the Afghans. An army of more than a Hundred Thousand men and a battery of the finest French cannons was brought together for the campaign. The campaign was headed by Peshwa Nana-saheb’s eldest son, Vishwasrao Bhau and Peshwa’s cousin Sadashivrao Bhau was entrusted the role of the Chief of the Army. The army marched northwards towards Delhi, its entourage swelled like an overflowing river in monsoons. Unfortunately the swell was of non-combatants like pilgrims, servants, entire families of the generality, work animals, etc. The Rajput’s stayed on the sidelines, neither supporting the Peshwas nor turning against them. The Sikhs offered their help, but Marathas undermined their strategic value. The two armies finally came face to face, each encamped itself of either side of Yamuna river. Skirmishes began, columns of the two armies tried to flank and out flank each other. They moved in circles trying to gain advantageous grounds for the final assault. But this movement of the armies landed the two armies in a peculiar position. Abdali’s army camped itself between Delhi and the Marathas. Cutting Maratha supply lines and blocking their safe way south to Delhi and back to Pune. On the other hand Marathas had positioned themselves between Abdali’s army and the roads to Afghanistan. Effectively blocking Abdali’s way back to Afghanistan. With supply lines blocked, the Maratha army nearly starved for a month. Sadashivrao Bhau was getting anxious and finally called all his generals to plan the final assault. The day of the battle was chosen, Wednesday 14th January 1761. The battle plan was layed out, a circular ring comprising of different army units would be created to secure all the non-combatants. The French cannons would form the center of the front line the infantry divisions on either sides followed by the cavalry units behind the big guns and behind them would stand regally the two majestic royal elephants carrying the two heroes of Maratha army. On one elephant would be Sadashivrao Bhau and Vishwasrao Bhau on the other, guiding their army from the center. The plan required immense coordination and synchronization amongst all the different army units to be successful. It was the sorts of strategy never used by the Marathas and many of the generals were against it. But desperate times call for desperate measures. 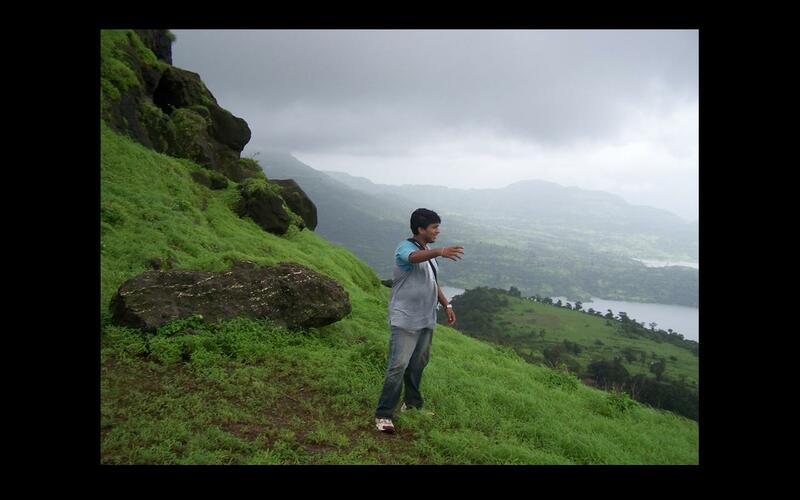 This was the best shot the Marathas had to victory. At the break of dawn, Maratha army stormed out of their camps. Morning fog was all around. Roars of battle cries filled the air. “Hara Hara Mahadev, chaaarrrge!! !” ordered the Maratha generals to their men. Abdali and his generals, jolted out of their beds. Afghan’s rushed to their posts, only to see the horizon filled with fog and dust from the Maratha cavalries hooves. The Maratha artillery lead the charge; their cavalry behind. It was a sight to behold. But for the Afghan’s it was a frightening sight even for their bravest of the brave. Maratha guns thundered at Abdali’s front-line. Afghans were being battered and only feebly did they manage to sustain themselves. Abdali pushed his camel mounted artillery and his infantry ahead. But in vain they could not break the Maratha lines. The Maratha’s pushed harder. Abdali’s center and flanks started to crumble. By mid-afternoon it seemed Maratha victory was certain. But fate had other intentions. Even Abdali was getting nervous and preparing for the eventuality of a loss, but he stood his ground patiently watching the action. Seeing the Afghan lines break and running helter skelter, the Maratha cavalry got overenthusiastic and charged to deliver coup de grâce. Maratha horses galloped over its front-line cannons and started to chase down the fleeing Afghan army. Having their own men in the line of fire, the Maratha’s ordered its cannons to stop the deathly volley that had brought them so close to victory. Then suddenly out of nowhere came a stray bullet that hit Vishwasrao in his chest. Sadashivrao saw the slumped body of his nephew and immediately jumped off his elephant and on to his horse and rushed to help Vishwasrao. In the meantime, Vishwasrao’s bodyguards brought his dead body down from the elephant. Both the royal elephants stood empty. Maratha army slowed its pace to take count of what was happening. What had happened? Where were they? Were they in thick of the action? Or worse, were they dead? Was there a different battle plan that was set in motion that the regular soldiers were not aware of? There was colossal confusion on the Maratha side. A wily fox that he was, Abdali was not late to notice this confusion in Maratha lines. He knew the time was right for one solid blow to the Marathas and they would crumble. With most of his front-line troops tired, beaten and battered, there was very little he could do with them. But he had one last trick up his sleeve. He had a small force of five thousand elite bodyguards by his side known as Khazilbaz. All fresh and battle ready. He ordered them to charge straight to where Sadashivrao and Vishwasrao were. Eager to avenge the deaths of their Afghan brothers the elite guard struck the Maratha lines like a battering ram. Sadashivrao Bhau fought valiantly but succumbed to the onslaught of the Afghan elite reserves. Nana-saheb Peshwa held himself responsible for the lives lost at the battle. He suffered from depression and died a year later mourning the death of his son, his brother and all those who had lost their lives at the battle of Panipat. But this story is not about death, defeat and destruction. We romanticize about the loss at the battle and contemplate the, what ifs. But we seldom talk about what happened after the dust of the war had settled. Madhavrao son of Nana-saheb was appointed as the next Peshwa of the Maratha Empire. The loss at Panipat was more physiological to the Marathas than to their actual polital standing. This could have marked the beginning of the end of Marathas. But instead of feeling hopeless of their plight and surrendering to fate and waiting for the end to relieve their suffering, Madhavrao Peshwa rose up as a guiding light. He made the defeat his battle cry. “Vengeance!!! The death of our brothers will not go waste. We vouch that their ultimate sacrifice will be a constant reminder for us to avenge them and restore the pride of the Marathas. Till the last amongst us is standing we will fight. We will not stop till our flag files high in all its glory atop the Delhi fort once again.”” he roared in the Maratha court. He rallied men and material for the cause. Under his command and with excellent war veterans like Mahadji Shinde on his side, Peshwa’s recaptured Delhi. Never again did anyone dare invade India from the north. Their are two type of people in the world, one who consider even the smallest of their failure as the end of the world for them, while there are those who consider failures as golden opportunity to achieve higher highs. When the times are tough its easy to surrender and give up. But always remember the saying “when the going gets tough, its only the tough who get going.” who do you wish to be? Make your defeat your battle cry. I remember the first time I attended Toastmaster session. When asked to introduced myself, I started with my work experience, my educational background and certifications I had completed. I paused for a second as I realized, that I was at a Toastmasters Club meeting, and not for a job interview. So I changed subjects to talk about why I was at the club and what I expected to get out of the club. I also talked about my hobbies. Cricket, music and mountains are my passion. Ever since that day, I have never missed a chance to get on stage and talk about mountains and my trekking experiences. And as I spoke, I have seen some eyebrows raised, doubting the credibility of my stories. I know it’s hard to believe a visibly unfit guy like me talk about mountaineering. So I thought to take this opportunity to substantiate my stories with photographic evidence. So let me jump straight to my presentation, where I’ll show you photographs of three my favourite treks. Before I tell you about this trek, I want to ask everyone; Which was you most memorable New Year’s Eve? I am sure most would have stories of an epic party with friends at a bar or a pub, or may be a club. For me this particular trek stands out. My friends and I planned to do something different that year. So the moment someone of us muttered Alang – Kulang – Madan, we all agreed in unison. 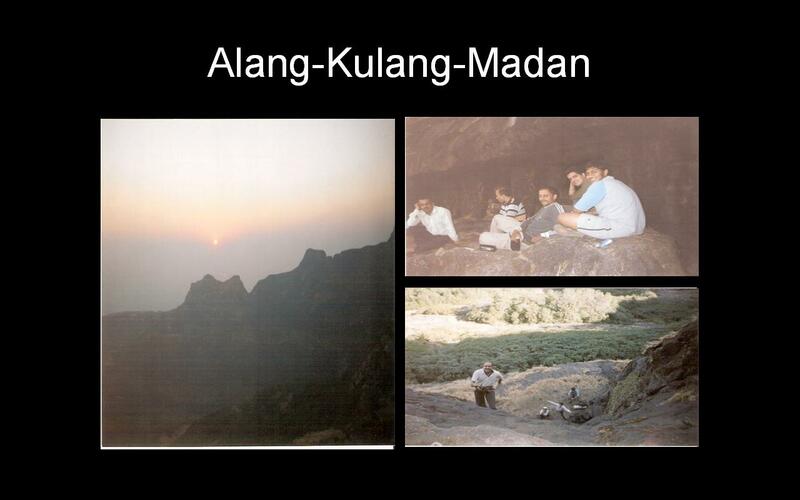 Alang- Kulang – Madan are three most isolate and remote forts in Maharashtra. Very few venture out to these forts, due to its sheer inaccessibility. We drove overnight to the base of the forts, then trekked through thick forests for good six to seven hours, with heavy sacks on our backs; only to face a huge rock wall smooth as a slate. With sun hurrying towards the horizon, we had to muster up as much strength as we could to anchor the ropes and climb the wall that stood before us. Our exhaustion was more than compensated for by the amazing view from the top. We setup a small camp fire and slept next to it gazing at millions of shimmering stars in the clear night sky. At the stroke of midnight the horizon on either side of the forts light up with fireworks set from the towns below. 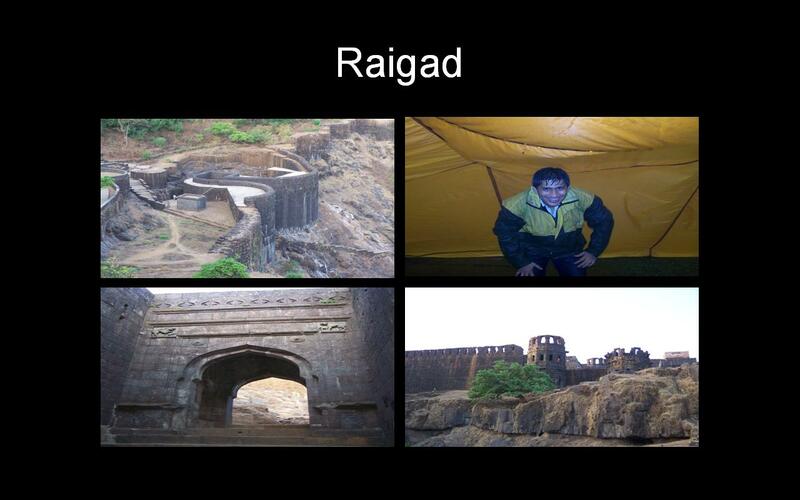 Raigad, the capital of the Maratha Empire. A perfect specimen of a formidable fortified fort. I have visited this fort many times, and each time the fort has surprised me with something new. By the way luck never seems to favor me when at this fort though. This one time, I broke my shoes and had to walk bare foot in the mountains on a hot summer afternoon. 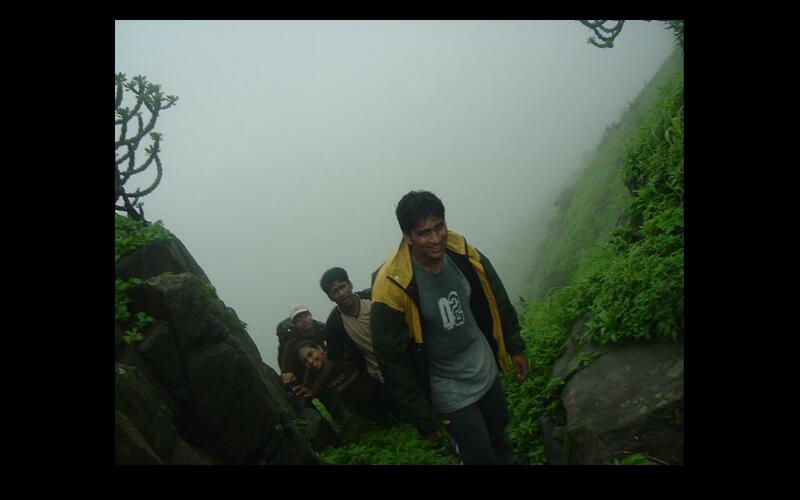 The other time I broke my toes and had to limp all through the trek. Most memorably, I remember, it rained so heavily that there was about three inches of water in our tent, I had to sleep sitting on our sack. 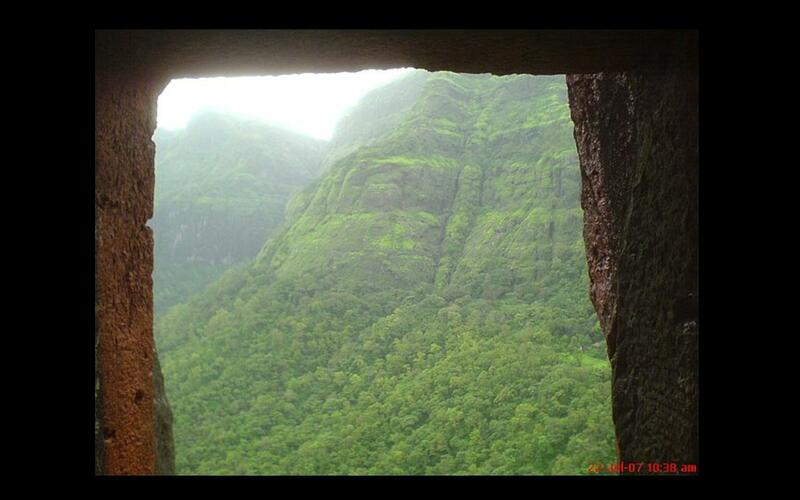 Just like Alang, this fort too is one of the most remote places in Maharashtra. 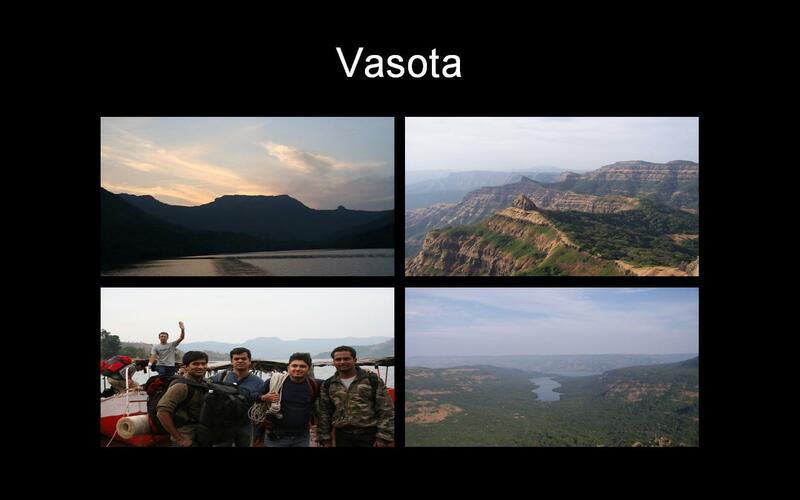 Fort Vasota is located in the back waters of the Koyna river. This fort marks the border of rain shadow region. Thick forest and large back waters of the Koyna river on one side and a complete barren landscape on the other side. One can clearly see the stark contrast between the two landscapes during summers. Due to its inaccessibility, Marathas used this fort as prison. Most dreaded convicts of their times were locked up here. Though this fort is heavily fortified, it has never been part of any famous battles. It exchanged hands only through treaties signed between kingdoms. Only story of a battle that I know was between Marathas and British. This too was a token fight, cause it is said that the British fired only three cannon balls at this fort and the fort was surrendered. Today, I shared only a few of my experiences with you all. My wife hasn’t been this fortunate. One day when I told her about one of my trekking experiences; she shrugged her shoulders and said, “Trekking twenty miles, with a twenty pound sack on your back, all day under the sun in the mountains is not a definition of a fun activity.That’s manual labour. Why would you do such a thing?”. To answer her question I showed her this photo. 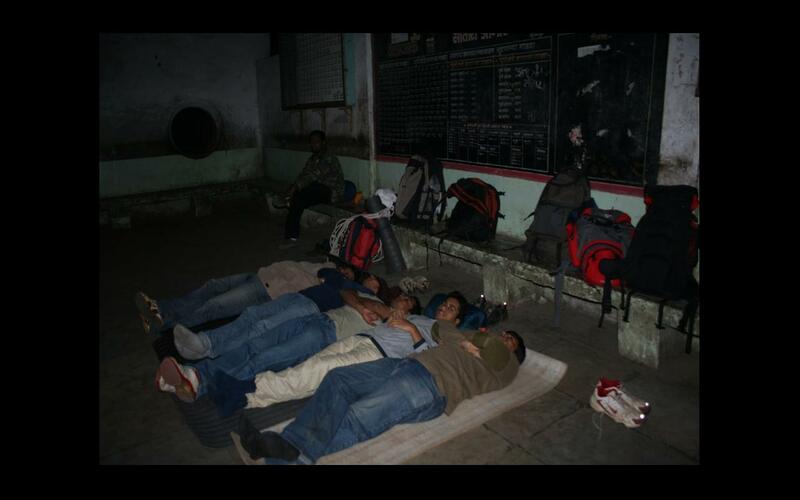 That’s me fast asleep on the floor of Satara Bus Depot after a long trek. But on a serious note my answer to ‘Why do I do it?’ is for three main reasons. With each trek I have a new realization of my capabilities. Capabilities that I knew I had and the one I didnt. Like the capabilities, I also have the realization of my limitations. With each trek I challenge myself and discover how far I can physically and mentally push myself. Every window has a different perspective. History is not dull and depressing as it is in our text books, and its definitely not as glamorous as shown in the movies. To really understand history you have to visit these forts and mountains. They give you a chance to visualize how things must have transpired in the past. I love to tell stories. The most vivid stories are only possible if you have had the opportunity to travel, explore, see and experience things first hand. With a large bag full of experiences that I have, make for some really exciting stories to tell.